More Finding Light Exhibition Photos! Here are a few more photos from my Finding Light exhibition currently up in USM's Goppert Gallery! I'm taking photos in batches (it is very hard to get good photos in low-light settings, so I take some, see if I have any good ones, post, and repeat!). It's not hard to take photos of the non-interactive parts of the show, so I haven't been focusing on those just yet since it's more important to figure out the photography for the interactive pieces since they're so tough to capture! So first up - here are some additional photos of All That I See. 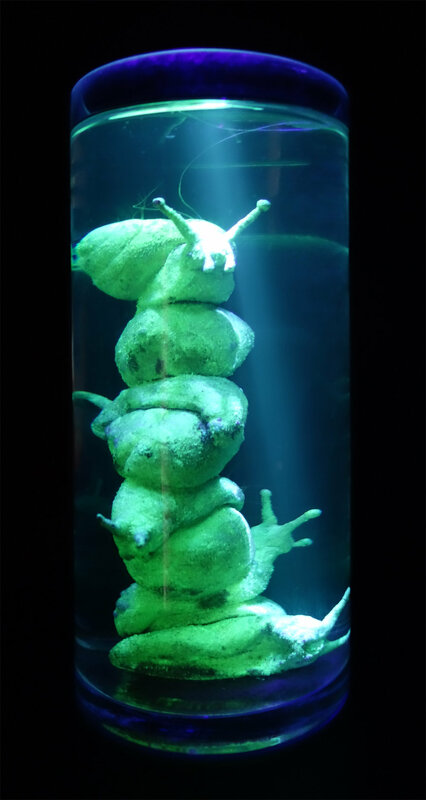 The algae that is growing on the sculpture is a local species - I took water from USM's pond and have been cycling it and keeping it alive and flourishing for several months now within the sculpture's glass container. Photo Teaser from My Exhibition Reception! This Friday was my opening reception for my Goppert Gallery exhibition Finding Light. I will share a more comprehensive set of photos with you in a bit, but here's a teaser! The show is up through March 9th if you want to experience it firsthand.